The two parashot this week both speak of payments, whether they are required by law or promised by free choice. 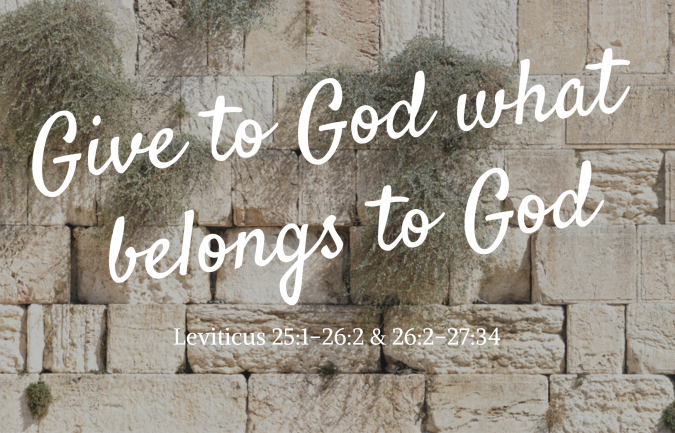 The first parasha (Leviticus 25:1–26:2) describes the Jubilee every fiftieth year, the time when all property returns to its original owners, and every slave is set free. Land could be ‘hired’ by others up to the fiftieth year, or people could sell themselves into slavery to pay off debts, effectively ‘hiring’ themselves out as slaves. If anyone wanted to buy back their land or their relative before the fiftieth year released them automatically, they would have to pay the amount that might have been earned from that property or person in the remaining years before the next Jubilee. The second parasha (26:2–27:34) also speaks about payments. The first chapter describes how God will reward Israel for obedience, but punish Israel severely for disobedience. The second chapter is the ‘Terms and Conditions’ for Israelites who promise to give something to God, usually as a bargain with God – for example, “If You heal my wife, I will give You one of my children to serve at the Tabernacle”, or “If you give me a good harvest this year, I will give one of my fields to grow crops for the Levites”. If people change their mind after making this sort of vow, they must pay the equivalent amount in money to the Tabernacle, usually adding 20% to the value. People and possessions are valued according to how much profit they would bring to God and His representatives if they were given to the Tabernacle or to the Levites to work for them. You cannot put a financial value on a person’s soul, only on their physical productivity. God values things that we promise to give Him. We may change our minds, and think that God will just forget what we promised, but the Bible tells us regularly not to make vows too quickly (see Deuteronomy 23:21-23 and Ecclesiastes 5:1-7). This still applies to us now. When we promise to serve God with our possessions, or with our lives, He accepts our gift. If we want to take it back, it is only right to give Him something even more precious. Throughout the whole passage this week, the message is that God puts value on things that belong to Him. If He values our personal gifts of money or time or service, how much more precious to Him are the people and land that He set apart to display His glory in the earth? The land of Israel belongs legally to the God of Israel (and now the whole earth does also, after Messiah Jesus received all authority as the Son of Adam because of His obedience and costly payment). The Jewish people also belong to God legally (and soon all nations will also). Neither the land of Israel nor the Jewish people can be bought permanently by others; eventually, they will go back to the original owners. The Jewish people have been enslaved by many nations, up until the Third Reich seventy years ago, but God never allows this to continue. The land of Israel has also been captured by many different nations over the last two thousand years, but it must eventually return to the owners God has chosen for it – the Jewish people. Jesus Himself predicted that “Jerusalem will be trampled underfoot by the Gentiles until the times of the Gentiles are fulfilled” (Luke 21:24). He therefore prophesied that even though the Jews would lose control over their capital city (which happened forty years later, in 70 AD), the time would come eventually when Jerusalem would return to its original legal owners. This happened finally in 1967, through the Six Day War. For the first time in nearly 1900 years, Jerusalem was again legally under the authority of the Jewish people. This week’s parasha says that every fifty years, all land must return to its original owners. This coming week (Wednesday 24 May) is the fiftieth anniversary of the re-unification of Jerusalem. Many believers are therefore wondering what the God of Israel will do this year again, to set free His land and His people. We pray that just as the land was returned to its rightful owners in 1967, so the people might return to their rightful Owner in 2017. The second parasha for this week describes what will happen when the Jewish people obey their God – “I will make my dwelling among you, and my soul will not reject you. I will also walk among you and be your God, and you shall be my people” (26:11-12). Soon He will return to walk among His people literally, when He ends the long exile of His people. Let us pray that we will see the Messiah’s return to Zion in peace soon and in our time, and that the Jewish people and all other people groups will joyfully submit themselves to His fair and faithful authority.